All online orders totaling over $300 will receive free shipping from Wooden Hangers USA within the Continental United States. (Note: Shipments destined for Hawaii, Alaska, Puerto Rico, USVI, etc., are not eligible for this offer.) 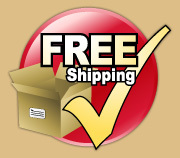 Orders eligible for free shipping will be sent via FedEx Ground, U.S. Postal Service, or common carrier. Need your order to be shipped outside of the 48 Contiguous United States? Please contact us for a freight quote on orders being shipped outside of the contiguous 48 states and APO locations. Items shipped to Hawaii, Alaska, Puerto Rico, USVI, and US Protectorates can be delivered by the US Priority Mail service.